Commodity performance has been mixed in recent years. A strong rally in 2016 was followed by more modest returns in 2017, with gains in industrial metals offsetting weakness in energy and agricultural commodities. As we move into 2018, I believe conditions are favorable for commodities. Here are four reasons to take a closer look. The US dollar slumped throughout much of 2017 before gaining modest ground in the fourth quarter. In light of the strengthening US economy, many prognosticators at this time last year expected tighter monetary policy to drive the US dollar higher. We were not among them. Instead, we maintained that global economic growth would bring international interest rates closer in line with those in the US, which, coupled with capital flows into foreign markets, would push the dollar lower in 2017. This call proved judicious. The dollar was off nearly 10% in 2017 — its worst performance in 14 years — and remains under pressure in early 2018, down roughly 3% in the month of January.1 Over the next year, we expect the dollar to continue to push lower, further stimulating global growth and demand for commodities as the jarring effects of global central bank policy divergence fade into history. This is not necessarily bad news. A weak dollar can be beneficial to US exporters, who may be able to sell dollar-denominated products overseas at lower prices relative to foreign currencies. 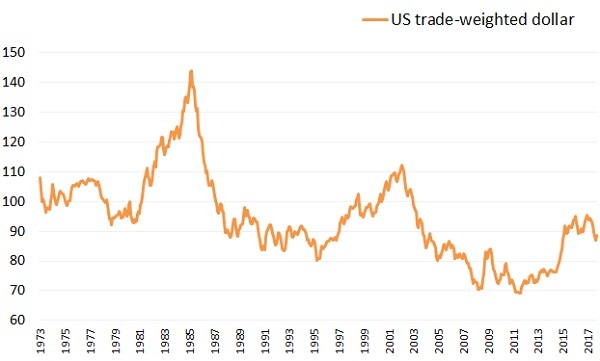 A weak US dollar can also provide a tailwind to commodities. This is because most major commodities are priced in US dollars. When the dollar falls in a broad fashion against other currencies around the world, commodities tend to rise in US dollar terms. And because the borrowings of many emerging market countries are also denominated in US dollars, a weak dollar can reduce the debt burden of these economies. Commodities could also find support from current trends in the petroleum markets. When it comes to energy prices, supply is paramount. Over the past 25 years, changes in global production volumes and the resulting impact on crude oil inventories have been the major determinants of crude oil prices. Recent years have been no exception, with falling oil prices paralleling the increase (and subsequent decrease) in output by the Organization of Petroleum Exporting Countries (OPEC) — part of the seesawing market contest with US shale producers. While disagreements abound in forecasting 2018 US shale output, falling capital investment and the recent flat line in reported US drilling activity and production are putting upward pressure on the estimated crude oil price levels at which US operators may be profitable. As a result, oil prices are trending higher, spurred largely by a historic counterseasonal drawdown in US crude oil inventories as the effect of OPEC’s late 2016 production cut agreement finally migrates to North America. 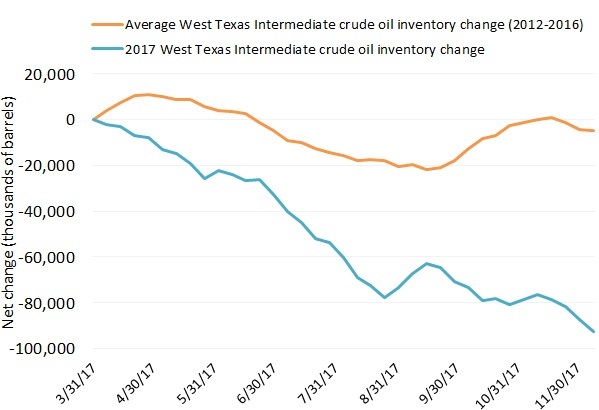 West Texas Intermediate found a bottom in the summer of 2017 and closed the year above $60 per barrel — a level not seen in more than two years. Recently, OPEC agreed to extend oil production cuts through the end of 2018, which could support crude oil total returns over the coming year. With the current oil futures curves in backwardation, investors in commodities are already experiencing roll yield opportunities in 2018. Backwardation implies a downward-sloped price curve whereby today’s spot prices are higher than prices for futures contracts. For example, as of Feb. 5, 2017, a March 2018 West Texas Intermediate futures contract was selling for $65 per barrel, while a December 2021 contract was priced at under $52 per barrel.2 Under this scenario, as investors roll between futures contracts, they sell current contracts at a higher price and buy the ensuring futures contracts at a lower price. This creates positive “roll yield” opportunities that can add up over time. Commodities have historically demonstrated among the highest correlations to the consumer price index (CPI) versus other asset classes, as seen in the graphic below.